There are many Colleges offering online early childhood education masters degree programs. Most Colleges require that you have a bachelor’s degree in education to be eligible for admission to a masters degree in education. Teaching experience may also be required. Some Universities, will admit you if you have a bachelor’s degree from an unrelated subject. Teaching experience may become mandatory in this case. To complete an online masters degree in early childhood education, teaching residency or research project or both will be required. You should get full information from all Universities you would want to consider to find out their requirements and what works best for you. The Northwestern College Online Masters of Education in Early Childhood Education degree program is the top program based on its high ranking score. This program is offered under the education department, which is one of the 4 institutions in Iowa that is accredited by the Council for the Accreditation of Educator Preparation (CAEP). The M. Ed in Early Childhood Education online program is a sure way of attaining prestigious positions in institutions of higher learning and nonprofit educational organizations. This online program is designed to fit the schedule of a person who has other responsibilities but needs to advance their education. The course work takes 2 years to be completed. The classes and assignments are readily available online. The tuition fee is affordable and students who take 6 credits in a semester are eligible for financial aid. The institutions’ affiliation to Christianity doctrine incorporates great values to students. The Higher Learning Commission of the North Central Association of Colleges and Schools accredits Northwestern University. The University of Missouri is accredited by the North Central Association of Colleges and Schools (NCACS) to offer an online Master’s in Early Childhood Education degree. By studying at the university, you gain knowledge and skills that will help you give quality educational services to small children. The program has a specific focus on special needs children and English language learners. It is designed for head start teachers, early childhood practitioners, child care center stuff and early childhood special education teachers. Courses taken include research with exceptional children, developing home-school partnerships, young children with autism and language early literacy development. • Applicants must own a Bachelor’s degree from an accredited institution with an undergraduate GPA of 3.0 letters of recommendation that support your academic potential and professional competence. • Tuition: the tuition cost for one credit hour is $350.10. • Financial Aid: aid accessible includes fellowships, scholarships, assistantships, loans and federal work-study for those who qualify. 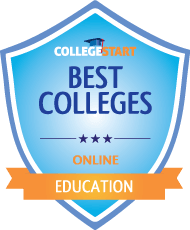 The Stephen F. Austin State University is one of the leading institutions offering a Master’s in Early Childhood Education online. The coursework duration is 22 months and students are required to complete 36 credit hours before they can graduate. Courses covered within the program include child development, leaders and advocates in ECH, language and literacy in ECH and ECH classroom interaction and management. Students are trained to become child development experts who upon graduating can go on to become researchers, school district specialists, consultants and college adjunct faculty. Students seeking enrollment are required to submit official transcripts from colleges or universities attended. The University is accredited by the Southern Association of Colleges and Schools (SACS). • Prospective students must also have a teaching certification in elementary education or early childhood. • Tuition: cost per credit hour is $286 for in-state and $315 for out-of-state. • Financial Aid: it includes federal loans and scholarships for those who qualify. Texas A&M University is a good place to get your Master’s in Early Childhood Education degree. One advantage of the degree is that it is fully available online. The program explores the psychological and physiological development of little children; from birth to grade four. Courses covered include literacy development in the early years, early childhood curriculum and child development. Students learn administration and management of classrooms, management of young children’s facilities and instruction strategies that will be effective on young children. Prospective students should apply with a $35 application fee, submit official transcripts from institutions attended and have official GRE scores. After completing the courses, students are required to write a comprehensive examination before they’re awarded the degree. • Texas A&M University is accredited by Southern Association of Colleges and Schools (SACS). • Tuition: the tuition cost per semester is $2,750. • Financial Aid: students can seek federal loans and grants to help pay for their education. The University of West Georgia offers the Master of Education in Early Childhood degree entirely online. The degree comprises of coursework and field sessions which give students a well-rounded learning experience. Topics covered in the program include knowledge and understanding of the classroom learner, research in Early Childhood Education, Advanced methodologies for content area instruction and social and philosophical foundations of education. Students learn how to make learning systems and environments suitable for everyone in the learning community. Admission requirements include a $40 application fee, official transcripts from accredited institutions and a bachelor’s degree in elementary education or early childhood education. The coursework is 36 semester hours long and can be completed in 1 to 2 years. The university is accredited by the Commission on Colleges of the Southern Association of Colleges and Schools (COCSACS). • The coursework is 36 semester hours long and can be completed in 1 to 2 years. • The university is accredited by the Commission on Colleges of the Southern Association of Colleges and Schools (COCSACS). • Tuition: online students pay $517 for a credit hour. • Financial Aid: aid available includes work programs and loans to qualifying students. The University of Albany offers the Master of Science in Early Childhood Education degree online. The degree has two concentrations; the Master of Science in Early childhood Education and Master of Science in Childhood Education. The first track has emphasis on children birth to Grade 2 whereas the second track is for teachers who wish to teach children in Grades 1 to 6. The coursework features literacy development, family partnerships, science, mathematics, social studies, literacy engagement, writing instruction and the Common Core Standards. The university’s accreditation is by the Middle States Commission on Higher Education (MSCHE) . • Students seeking admissions must have a bachelor’s degree with a minimum GPA of 3.0, own a teaching certification and 3 reference letters. • Tuition and fees: the annual cost for in-state students is $10,870 and $19,590 for out-of-state students. • Financial Aid: students may apply for federal loans, federal work-study programs and New York state Awards. The Master of Arts in Early Childhood Education is one of the programs offered online at University of Colorado – Denver. The degree program is accredited by the Council for the Accreditation of Educator Preparation (CAEP) and Council for Exceptional Children (CEC). Courses covered throughout the program include working with parents and families, literacy development, collaborating in schools and communities and advanced child growth and development. By the time they’re through with the program, students will have the ability to meet the needs of little children and their families. They’re prepared to succeed in all classroom and educational settings, child care programs and early intervention programs. In order to graduate, students are expected to complete a comprehensive examination, fieldwork, performance-based assessment, practica and all recommended courses. • The program has a 36 credit hour coursework. • Tuition: the cost per credit hour is $427. • Financial aid: students may seek student loans, federal grants and work-study plans. Arizona State University offers Master of Education in Curriculum and Introduction with Early Childhood Education concentration. You can study for this degree online and enjoy same benefits as on-campus students. Through this program, students will be well prepared to meet so as to meet the social, emotional and educational needs of children. They are taught community collaboration, policy analysis, childhood pedagogy,technology, advocacy and administration. The track best suits students with a teaching certificate. • Applicants are required to have a bachelor’s degree from a regionally accredited institution, have maintained a grade B in the last 60 semester hours of undergraduate coursework, submit a personal statement and 3 professional recommenders. • Arizona State University is accredited by the Higher Learning Commission of the North Central Association of Schools and Colleges (HLC-NCASC). • Tuition: one credit hour is $565. • Financial Aid: students may seek help in form of grants, scholarships, loans and fellowships. The University of Nebraska offers online master’s in education with a specialization in Early Childhood Special Education. The curriculum taught is built on the principles set by the Council for Exceptional Children, Division for Early Childhood. It prepares students to effectively work with families, preschool children and babies with disabilities. Courses covered in the degree program are Autism, Early Childhood Education and Research Design. The coursework comprises 56 credit hours. The student is taught children services that are family-centered, community-based, comprehensive and correct in terms of development. • The program is designed for special education teachers, early childhood teachers, health and social service specialists and teachers who wish to work with special needs students. • The institution is accredited by the North Central Association of Colleges and Schools (NCACS). • Tuition and fees: the cost per credit hour is $325.50 for residents and $1967 for non-residents. • Financial Aid: aid accessible includes loans and scholarships. Erikson Institute offers early childhood educators the opportunity to advance to a Master of Science in Early Childhood Education degree through online studying. The degree program is approved by Illinois Board of Higher Education (IBHE). The program is developed for individuals who have post-baccalaureate experience teaching early childhood education. It gives students insight as to how children learn and grow and also how their culture, families and communities influence their development. The coursework features core child development, assessment of classroom teachers, family culture, language and play and leadership in early childhood. In the course of the degree program, one may study for a Bilingual or English as Second Language (ESL). • Applicants are required to submit an essay, their work history, 3 recommendation letters and request for official transcripts from institutions attended. • Tuition: cost per semester hour is $1,000. • Financial aid: aid available includes student loans, grants, scholarships and fellowships. Kennesaw State University offers Master of Education in Early Childhood Education online. The program is designed for certified early childhood educators who plan on gaining more knowledge in order to have efficiency and impact in their practice. Students have the opportunity to earn an endorsement or a Kennesaw State University certification within the course of their degree program. These endorsements include Online Teaching, Teaching Leadership, Reading, Gifted Endorsement and a Montessori Concentration certificate. Kennesaw State University is accredited by the Commission on Colleges of the Southern Association of Colleges and Schools (COCSACS). • Courses taught include educational research and prospectus, essentials of technology strategies and skills, integrated models of instruction and trends or issues in science for Early childhood program. • Applicants need to have teaching certificates, bachelor’s degree and submit official transcripts from all colleges attended. • Tuition and fees: the cost for one credit hour is $613 whereas 12 credit hours amount to $5,243. • Financial aid: students may seek loans, scholarships, federal aid and assistantships.